Notes | Armed with a camera and a fresh cache of film and bankrolled by a Guggenheim Foundation grant, Robert Frank crisscrossed the United States during 1955 and 1956. The photographs he brought back form a portrait of the country at the time and hint at its future. He saw the hope of the future in the faces of a couple at city hall in Reno, Nevada, and the despair of the present in a grimy roofscape. He saw the roiling racial tension, glamour, and beauty, and, perhaps because Frank himself was on the road, he was particularly attuned to Americans' love for cars. Funeral-goers lean against a shiny sedan, lovers kiss on a beach blanket in front of their parked car, young boys perch in the back seat at a drive-in movie. A sports car under a drop cloth is framed by two California palm trees; on the next page, a blanket is draped over a car accident victim's body in Arizona. 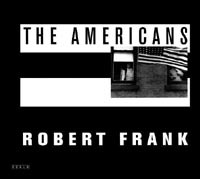 Robert Frank's Americans reappear 40 years after they were initially published in this exquisite volume by Scalo. Each photograph (there are more than 80 of them) stands alone on a page, while the caption information is included at the back of the book, allowing viewers an unfettered look at the images. Jack Kerouac's original introduction, commissioned when the photographer showed the writer his work while sitting on a sidewalk one night outside of a party, provides the only accompanying text. Kerouac's words add narrative dimension to Frank's imagery while in turn the photographs themselves perfectly illustrate the writer's own work. Comments | [01/03/12] I recently got the "extended" version of this book, and I couldn't recommend it enough. Filled with all of Frank's great work found in the original edition, it also has all of his contact sheets including marks for selection, and more. Such a great book. Comments | [01/06/09] This collection of photos is a wonderful story for all admirers of photography. You do not need to be a photographer in order to enjoy this great piece. The images and sequence are memorable and its easy to see how such a trip can transform any viewer or fellow follower of such a journey. Comments | [05/28/05] Anytime anybody asked me to suggest a photo book to get or give this is the book I recommend. The quiet moments that Frank captured stay with you long after you put down the book. It is very personal form of photojournalism that draws you in and makes you examine the photographs and not just give them a quick look. Comments | [05/27/05] I think it is only appropriate that Jack Kerouac wrote the introduction for this book. Robert Frank did with pictures in “The Americans” as what Kerouac wrote in “On the Road.” The book tells a story in American culture. A story that is still pretty accurate today. Comments | [03/18/04] If I had to pick one photo book to keep, this is the one. One of the few photographers that I admire more every time I look at the book. Comments | [03/12/04] This is the most important photo book of the last 50 years bar none. It pointed out the hipocrisy in American culture. If you have one book to give or show this is it. The sad thing is The Americans still rings true. Comments | [02/23/04] I was looking for books to buy and based on the little bit I remember seeing of it/heard about this one, I figured I couldn't go wrong. And I was right. There are some photos that just seem timeless no matter when they were taken. Frank's photos definitely fall into that category. Comments | [07/05/03] This seminal collection is the result of a creative collision between Modernist documentary vision and the hip jive of the Beat generation. The ultimate road trip record that set the visual tone for American photography for much of the '60's and the early 70's. If you have a photo book collection of only five titles, this had better be one of them.